Militant Islam Monitor > Articles > Suicide bomb attack kills 4 women at shopping mall - Sharon says " attack will not put an end to withdrawal"
Suicide bomb attack kills 4 women at shopping mall - Sharon says " attack will not put an end to withdrawal"
US warns Israel against "racheting up the violence"
MIM: It appears that blowing up Israelis should be no reason to retaliate according to the US government or in any way alter the plans to deport Jews from the West Bank as far as the Israeli government is concerned. Instead, the White House is urging Israel to use restraint and"be cautious about not ratcheting up the violence" and called on terrorists to stop terrorism while the Israeli Prime Minister has announced that the "attack will not put an end to withdrawal" which is amounts to a guarantee of more bombings. Collateral damage seems to have taken on a new meaning in Israel - civilians are no longer expendable as inevitable victims of a conflict - they are not even mentioned as being the targets of an attack. Instead it is the 'truce' and 'peace process' which has been harmed by terrorism. True to form, Paid Assassins chief Abu Mazen's statement on the attacks was couched in newspeak and hyped as a condemnation - when in fact, it was an admonition to the terrorists for "causing harm to Palestinians" by potentially jeopardising the Israeli deportation of Jews from Gaza. "...Mr Abbas condemned the bombing as a "terrorist attack". "Those traitors are working against the Palestinian interest," he said. "There is no rational man who can do those things on the eve of the Israeli withdrawal from 22 settlements..."
As far as no rational men are concerned the Israelis seem to be striving to outdo the terrorists in calumny. Israeli government spokesman,Ranaan Gissin stated that : The Prime Minister was very clear- nothing - but nothing- is going to stop the disengagement. If there is fire, we will take care of the fire, and then we will continue." MIM: The terrorists are also intent on continuing since "40 minutes before the Netanya bombing West Bank police foiled a car bomb attack in the Shavei Shomron settlement close to Nablus". The use of suicide bombers to kill Jews has become so matter of fact that many headlines read " Bombing shatters five month truce" and made no mention of the four women who had been blown up on the way to a shopping mall and the scores of wounded who had been hit by nails and metal pellets put in the bomb to cause maximum carnage. As usual the bomber came from Tulkarem , a town which had been 'turned over' to control of the Paid Assassins, and Israel went back in which created the usual outcry from the 'international community' about Israeli agression . BEIJING, July 13 -- The United States is urging the Palestinian National Authority to take measures to avoid any occurrence of future violence in Israel. White House Spokesman Scott McClellan says the Palestinian side should adopt practical measures, after a Palestinian suicide bomber detonated explosives outside a shopping mall in central Israel Tuesday. At least three people were killed and dozens more were wounded. US State Department officials say Israel should not delay a planned pullout from the Gaza Strip and West Bank, because of Tuesday's attack. Palestinian authorities and Israel both condemn the bombing. Palestinian leader Mahmoud Abbas has denounced it as a crime against the Palestinian people and vowed to punish the perpetrators. A senior Palestinian security official says the Palestinian National Authority decides to attack the militant group Islamic Jihad. Israeli officials blame the Palestinian National Authority for not effectively reining in its militant groups and threaten to take action. The militant group Islamic Jihad claimed responsibility for the attack in a telephone call to the Reuters news agency. Israeli television reports that a Jihad official told Lebanese satellite channel Al Manar that the attack was in response to the recent Israeli Cabinet decision to speed construction of a security barrier around Jerusalem. Others in the Jihad said the attack was in response to Israeli attempts to arrest and target its leaders. It was the first suicide bombing in Israel since a Palestinian blew himself up outside a Tel Aviv beachfront nightclub in February, killing five Israelis. AT LEAST three Israeli women were killed and 40 people injured when a suicide bomber blew himself up outside a shopping mall in the coastal town of Netanya yesterday. The attack was the first suicide bombing in Israel for four months. Israel responded by sealing off Gaza and the West Bank. The bombing will fuel right-wing calls for Ariel Sharon, the Prime Minister, to cancel the Gaza withdrawal scheduled to begin next month, but officials moved quickly to insist that it would not derail the pullout. Police said that the bomber detonated his explosive belt in the main street outside the Hasharon Mall at about 6.30pm. Rescue officials said that the bomber appeared to have set off the bomb after seeing a security guard searching people outside the mall. Miriam Fierberg, the Mayor of Netanya, was sitting in her car at the crossroads 20 yards away as she drove to the Maccabiah Games, the athletic competition for Jewish competitors from around the world. She said: "I was just dialling the telephone when I heard the boom. I felt the car jump in the air and the mirror fell off. I looked up and saw the air filled with smoke and body parts flying everywhere." Islamic Jihad immediately claimed responsibility for the attack in a call to a news agency in the Palestinian town of Tulkarm, ten miles from Netanya across the green line. In a video released last night, the bomber, Ahmed Abu Khalil, 18, from a village near Tulkarm, echoed the group's line that it is committed to calm, adding: "but we have to retaliate for Israeli violations". His family said they last saw him when he told them he was going to collect his school exam results. It was unclear if Israel will continue with plans to hand over security control of Bethlehem in the coming days. Violence has fallen sharply since Mr Sharon and Mahmoud Abbas, the Palestinian Authority President, declared a ceasefire in March. 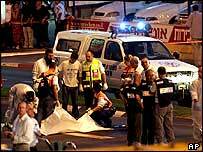 The previous bombing was on February 25, when an Islamic Jihad member killed five Israelis outside a Tel Aviv nightclub. At least 40 Palestinians have been killed since then. Mr Abbas condemned the bombing as a "terrorist attack". "Those traitors are working against the Palestinian interest," he said. "There is no rational man who can do those things on the eve of the Israeli withdrawal from 22 settlements." Ra'anan Gissin, a spokesman for Mr Sharon, accused the Palestinian Authority of doing "absolutely nothing" to curb the militant groups and gave a warning that if the 50,000 to 60,000-strong Palestinian security forces did not act, "it leaves us with no choice, as harsh as it may be, to take all the necessary measures". However, he insisted that the attack would not derail the Gaza pullout. Mr Gissin said: "The Prime Minister was very clear — nothing, but nothing, is going to disrupt and stop disengagement. If there is fire, we will take care of the fire first and then we will continue." Mahmoud Abbas's Palestinian Authority has invited the Damascus-based leaders of the Hamas terrorist organization to relocate their base of operations to the Gaza Strip following Israel's planned withdrawal from the area. According to the Saudi daily newspaper Al-Watan, PA Civil Affairs Minister Mohammed Dahlan urged Hamas chief Khaled Mashal to move his office to Gaza after all Israeli security personnel had vacated the coastal strip. The invitation followed heavy US pressure on Syria to close down Hamas operations in Damascus. "We want to see you [Mashal] among us," said Dahlan, who, despite clearly being at odds with American security interests, remains a favorite of the Bush Administration. Senior PA officials said radical Tunis-based PLO political department head Farouk Kaddoumi also plans to relocate to Gaza following Israel's departure, The Jerusalem Post reported. Kaddoumi rejects the existence of a Jewish state in the Middle East. The PA has been pressuring Israel to relinquish control over Gaza's airport, seaport and other borders crossings along with the evacuation of Jewish civilians and soldiers in order to allow the unimpeded entry of such unsavory characters. Many Israelis fear the withdrawal will result in Gaza becoming an unchecked haven for Islamic terrorists, including the global Al Qaeda network.